Children absolutely love doll houses, no doubt about it. Whether it’s a simplistic, basic design or an intricate, highly elaborate composition full of color and odd patterns, they seem to enjoy the exuberant nature of them. Now, it needs to be said that these toys can vary quite a lot from one another, not just in regards to design and construction but price-wise. What makes the whole thing even harder is the crazy array of dollhouses out there, a seemingly neverending selection that appears to be getting broader every month. To make sense of it all, we put together a list of the ten best doll houses money can buy. The Wooden Wonders Cozy Cottage Dollhouse comes with 14 pieces of furniture with 2 floors packed with fun and a spacious balcony area. Equipped with 3 play people each measuring 4.25 inches in size and made with wood and textiles, the house features a spiral stairway that goes up to the balcony which is on the second floor. Crafted from all natural high-quality wood and painted with child-safe paint, it measures 17 inches in length, 16.5 inches in height, and 9.75 inches in width. This makes it rather large for a budget dollhouse by most metrics. Designed with 4 rooms, 2 balconies and 3 levels of fun, the KidKraft 65850 Florence Dollhouse comes with an exciting set of accessories. Including a classic canopy bed with an elegant sofa and a grandfather clock, it features well detailed, fine artwork and patterns. Made with sturdy, heavy-duty wood, the frame boasts durability. Featuring colorful graphics, vibrant patterns, and classic furniture pieces, the set comes packaged with a step by step guide on how to assemble the house. 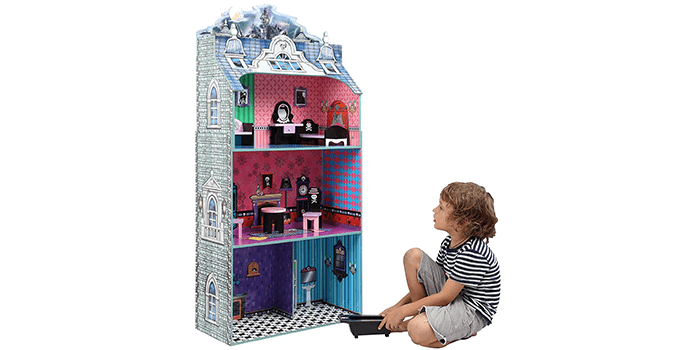 Made with sturdy, high-quality wood, the Teamson Kids – Monster Mansion Wooden Doll House features open rooms with no walls to help with convenient and easy accessibility while playing. Featuring 3D furniture, it comes with 12 pieces of accessories that fill the kitchen, bathroom, living room and bedroom. Measuring 32 inches in length, 11.50 inches wide and 51.50 inches high and ideal for Barbie dolls, this dollhouse set comes with a clear set of instructions and steps to help with easy installation. 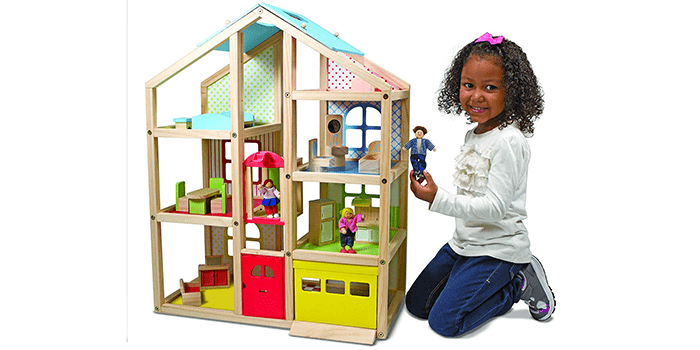 Ideal for home and school use, the Melissa & Doug Hi-Rise Dollhouse and Furniture Set is designed with an open-sided construction, enabling your child to play with ease. Featuring gender neutral vibrant colors and patterns, it comes equipped with an elevator and a garage. 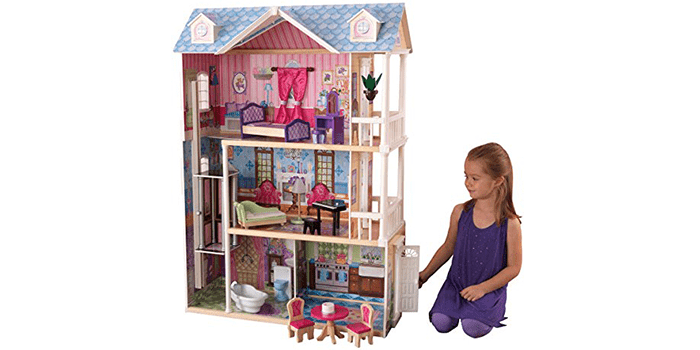 Unlike most of its kind, this dollhouse set comes with 3 playing people and 15 pieces of durable, sturdy furniture that enhance your child’s playing experience. 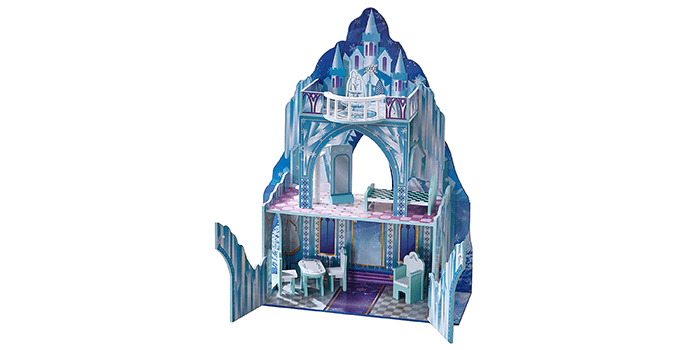 The Teamson Kids – Ice Castle Wooden Doll House is a durable play set made from wood, featuring 3 levels designed with vibrant icy colors. Ideal for dolls the size of a Barbie, the house is crafted with no walls and is open-faced, enabling quick access while allowing your kids to play with ease. Including 6 pieces of sturdy furniture, this doll set is light in weight, durable and extremely safe for your children. Packed with a step by step guide on how to set up the house, it is easy and quick to assemble. Crafted with a sturdy, well-constructed frame, the Calico Critter Cozy Cottage Starter Home comes equipped with 15 pieces of various accessories and furniture. Pre-assembled and ready to play right out the box, it features a movable floor that can be reversed. 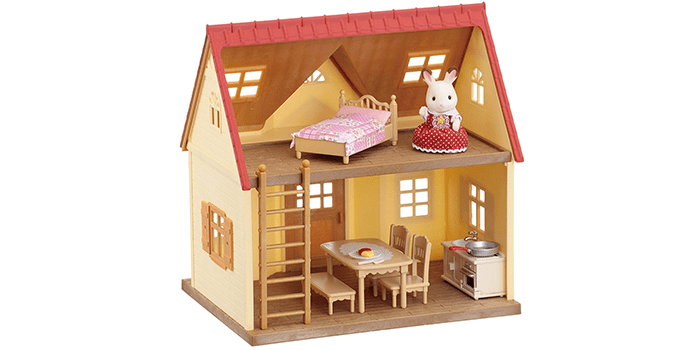 Measuring 12 inches by10.75 inches by 8 inches, the dollhouse comes with a ladder, a stove, and sink, a bed, a table with chairs, a Bell Hopscotch Rabbit and other accessories. 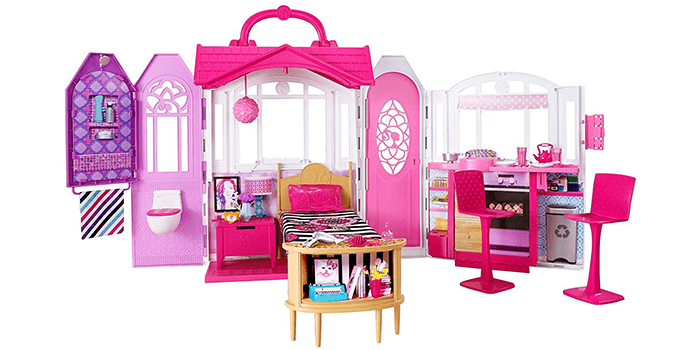 Equipped with 14 pieces of furniture including a grand piano and a classy bed with a dressing table, the KidKraft My Dreamy Dollhouse is a high-quality play set that is large in size. Unlike any other dolls house, this one comes with an elevator that glides up and down taking your dolls to the second and third level of the house. Constructed with heavy-duty composite wood products, it is big enough for a normal sized Barbie doll and can be played with by more than 1 child at a time. Featuring a toilet that flushes with sound effects, lamps that light up and a piano that plays, the house comes with step by step instruction on how to assemble it without any hassle. 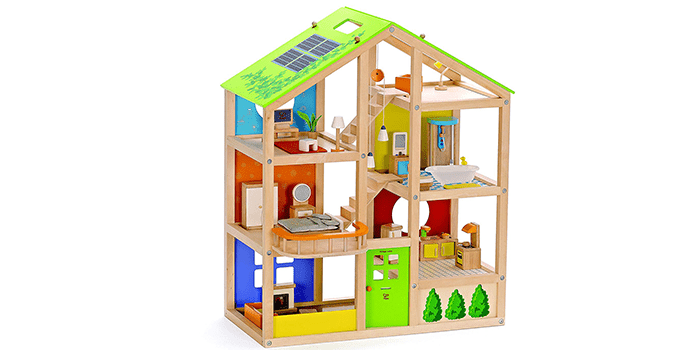 Featuring a solid, sturdy wooden construction, the Hape – All Seasons Wooden Doll House is a durable playset that comes with a child safe painted finish. Designed with 3 levels, it helps to stimulate and enhance your child’s imagination. Equipped with 6 rooms with 4 room sets including a master bedroom, a media room, a bathroom, and a kitchen. Furnished with all the necessary household utilities and home items including a bed, cupboard, the house can be put together and arranged any way you like. Considered one of the best of its kind, the Barbie Glam Getaway House is one of the most intricate dolls houses you can find. Uniquely crafted with an open/close design, it opens up to an adorable kitchenette including a bedroom, and a bathroom. Equipped with a handle and a latch mechanism, this dolls house can be packed up and carried with ease and played with on-the-go. 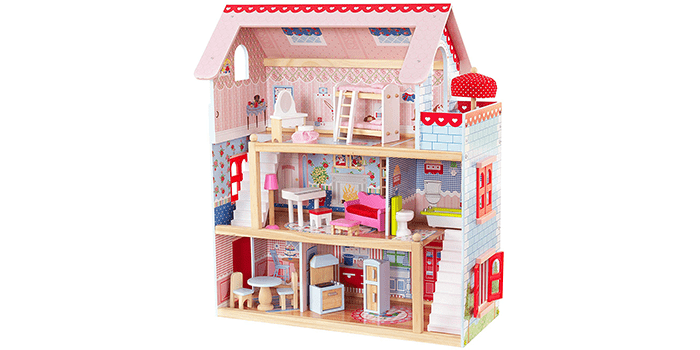 Featuring vibrant, colorful accessories and a wide range of furniture, this dolls house will help to stimulate and enhance your child’s role-playing skills and imagination. 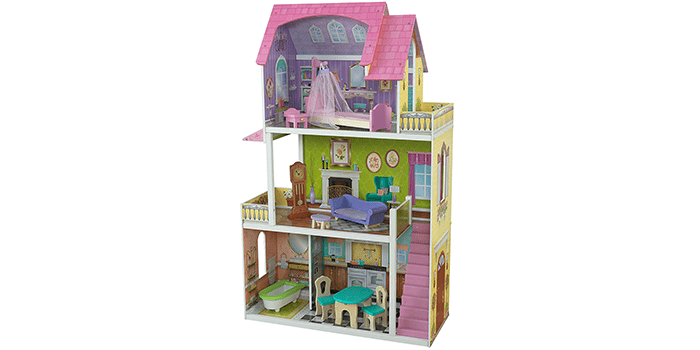 Featuring a heavy-duty, sturdy wooden construction, the KidKraft Chelsea Doll Cottage comes designed with 3 floors, a balcony area, and 5 rooms. Crafted with detailed artwork with 17 pieces of furniture and accessories made from wood, plastic, MDF, and fabric, it comes with two uniquely molded staircases made with high-quality plastic. Another great feature is the windows and doors that open and close, allowing easy accessibility and realistic playing experience. Packed with a quick guide with step by step instructions on assembling the house, this set makes an ideal gift for any child.